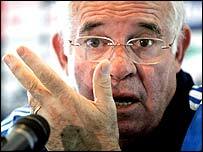 Luis Aragones says his conscience is clear after being quizzed over alleged racist comments about Thierry Henry. The Spain coach was asked by British journalists about the incident ahead of his side's friendly against England. "I know who is racist. I remember the colonies. There are some who have run after them like wolves after prey," he said, referring to Britain's past. Aragones said his comments in October were meant to motivate Henry's Arsenal team-mate Jose Reyes in training. He has not made a personal apology to Henry, although the Spanish Football Federation apologised formally to Arsenal. "I can't say if it's a reply to what I could have said or not but, in my opinion, racism is a question of conscience and I have my conscience clear," Aragones added. "A lot of black people have also said that. I am a citizen of the world. My job has made me adapt to every city or area where I have lived. "I have a lot of black friends but I don't understand why people are still talking about the issue." England's players made a public stand in their training session in Madrid, pointedly wearing anti-racism T-shirts. Coach Sven-Goran Eriksson said: "The players have worn shirts against racism and that's very good. I was asked if I like the idea, and I said that I did. "I don't really know what (Aragones) meant or what he said exactly. What I can tell you is that I have always been against racism. "For me, the colour of your skin is absolutely not important."